From Alaska to Montana, we’ve been hearing reports of grizzly bears up and about as spring arrives to the Northern Hemisphere. Food can be scarce when bears emerge from their dens after a long winter sleep, and this is a critical time when bears are especially vulnerable to the temptations of human foods like garbage and bird seed. The single most important thing you can do for bears right now, if you live in bear habitat, is to take a walk around outside your home and scan for bear attractants. Do you keep your garbage outside? Check with your local municipality or solid waste service to see if bear resistant garbage containers are available. Or, store your garbage inside until the morning of trash pickup. Stinky items can be stored in a sealed bag in your freezer until the day of pickup. Are your birdfeeders still up? It may seem cute at first to watch a bear at your birdfeeder, but it won’t be cute when that bear refuses to leave the feeder, or if that bear gets killed down the line for learning bad habits from people. When the bears are out, birds usually have natural foods available, so it’s a good idea to take your birdfeeder down for the warmer months. Backyard chickens? Do yourself, your birds, and the bears a favor and put an electric fence around it! Chickens are one of the top problems for bears across North America these days, and when bears raid the chicken coop, too many of them (both chickens and bears) wind up dead. Electric fences, when set up properly and maintained, are an easy and inexpensive way to keep your chickens and the bears safe. Thank you for being bear aware! 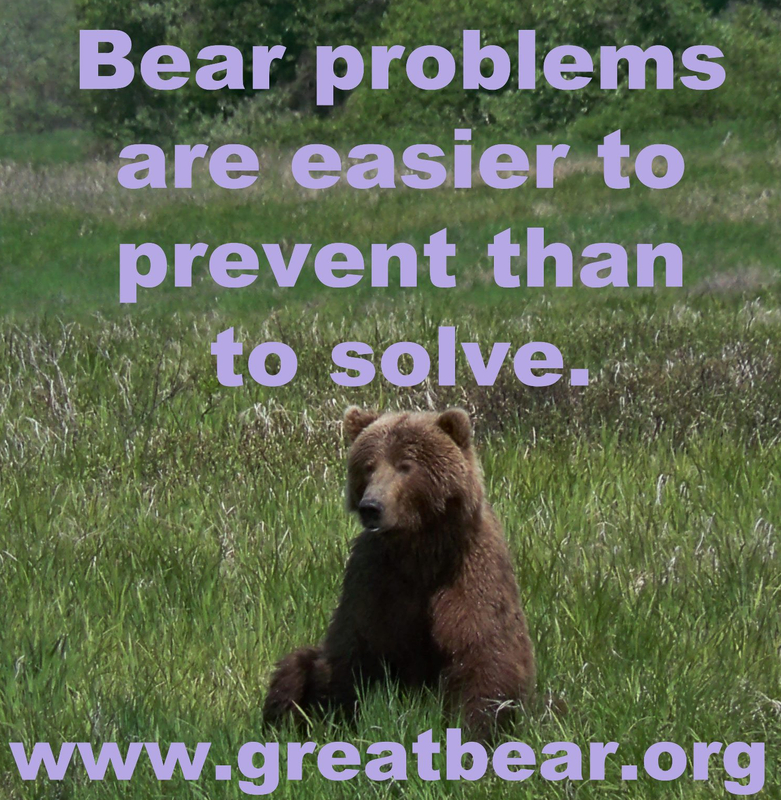 Bear problems are easier to prevent than to solve!